This is one book in a set of twelve for little hands to hold and which cover some of the most accessible Jesus stories. They are designed to be read aloud with 3-5 year olds. 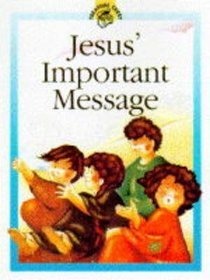 About "Jesus' Important Message (Treasure Chest Series)"
Lois Rock is a highly respected and trusted author, acclaimed in many different countries for her books of prayers and Bible stories. Her books have sold over 4 million copies worldwide. Lois lives in Oxfordshire and enjoys cycling around the Chilterns with her husband. She is the mother of three children and has helped to lead church children's groups for many years, experience that she draws on when writing books for children. Amongst her best-selling books are My Very First Bible, A Little Life of Jesus, The Lion Bible: Everlasting Stories, The Lion Book of Five-Minute Bible Stories, The Jesus Encyclopedia and The Lion Illustrated Bible for Children.- Publisher.